Luopa people mainly live in the southeast of Tibet. Most of them live by farming. The Luopa people are very skillful. Their handworks plaited with bamboo are exquisite. Both of the two races only have oral language, no written one. Most of them believe in their own aboriginal religion, with a few as Buddhists. Though monogamous marriage is the main marriage form, polygamy still exists. In the past, they had behindhand economy and medical treatment due to the poor transportation of their regions. Now the state is rapidly improving under the support of government. The Sherpa people mainly live in Dingkye and Nyalam of Shigatse . Sherpa means oriental in Tibetan. Most of the Sherpa people are Buddhists and engaged in farming and boarder trade. Compared with other races, Deng has a relatively smaller population. The Deng people mainly live in Dyayul, southeast of Tibet. They believe in ghost, not god. The Deng people have their own language, but neither Sherpa nor Deng has written language. The Deng people keep a record of events by knotting ropes or making marks on wood. Han Chinese is the second largest population in Tibet. Most of them are cadres and technicians dispatched to Tibet to help its development. Most of the Hui People now living in Tibet are those who immigrated there from other provinces during the Qing Dynasty (1644-1911), mainly engaged in business, handicraft industry and butchering. 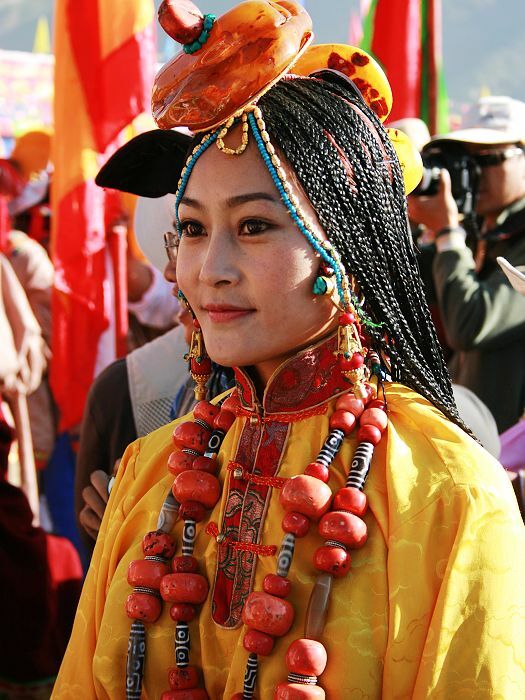 Other races in Tibet, such as Naxi, Nu, etc., mainly live in cities, with a small population respectively.